Since antiquity, armies have used animals to assist them. Elephants, horses, dolphins, pigeons, cats and dogs have been trained to serve as the partners of soldiers and help them in their missions. Some have even been awarded medals for bravery. 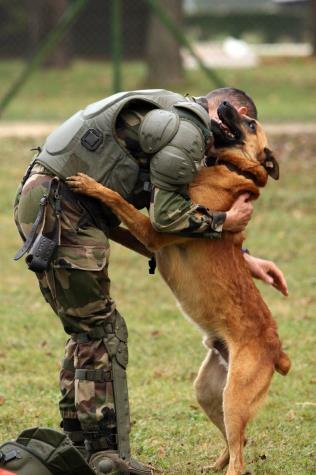 In the French Army, one infantry battalion specialises in training about 300 soldier-dog pairs every year. This is the 132nd dog battalion of the French Army (132 nd BCAT), which is assigned directly to the 1st Division and based in Suippes (Marne). These man/dog pairs are trained to support the infantry units. Perfectly trained, the dogs are a vital aid in the detection of explosives, narcotics, searching for the wounded, missing etc ... Their saint's day traditionally takes place on Saint Roch Day in memory of this 14th century pilgrim who healed the sick of the plague. That was up until the day when he himself was struck by the plague and withdrew to the woods. Here a dog brought him bread every day that it had stolen from its master's table. He is always represented showing his plague sores with a dog standing by his side. In French, the saying 'c'est saint Roch et son chien' (it's Saint Roch and his dog) refers two inseparable people.